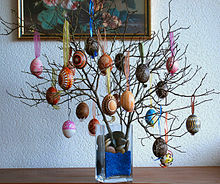 Easter eggs, also called Paschal eggs, are eggs that are sometimes decorated. They are usually used as gifts on the occasion of Easter. As such, Easter eggs are common during the season of Eastertide (Easter season). The oldest tradition is to use dyed and painted chicken eggs, but a modern custom is to substitute chocolate eggs wrapped in colored foil, hand-carved wooden eggs, or plastic eggs filled with confectionery such as chocolate. However, real eggs continue to be used in Central and Eastern European tradition. Although eggs, in general, were a traditional symbol of fertility and rebirth, in Christianity, for the celebration of Eastertide, Easter eggs symbolize the empty tomb of Jesus, from which Jesus resurrected. In addition, one ancient tradition was the staining of Easter eggs with the colour red "in memory of the blood of Christ, shed as at that time of his crucifixion." This custom of the Easter egg can be traced to early Christians of Mesopotamia, and from there it spread into Russia and Siberia through the Orthodox Churches, and later into Europe through the Catholic and Protestant Churches. This Christian use of eggs may have been influenced by practices in "pre-dynastic period in Egypt, as well as amid the early cultures of Mesopotamia and Crete". 2 Tradition, Old Customs and Relations back to the past. Tradition, Old Customs and Relations back to the past. This established the tradition of Pancake Day being celebrated on Shrove Tuesday. This day, the Tuesday before Ash Wednesday when Lent begins, is also known as Mardi Gras, a French phrase which translates as "Fat Tuesday" to mark the last consumption of eggs and dairy before Lent begins. After making this statement it is said the egg immediately turned blood red. Red Easter eggs', known as kokkina avga (κόκκινα αυγά) in Greece and krashanki in Ukraine, are an Easter tradition and a distinct type of Easter egg prepared by various Orthodox Christian peoples. The red eggs are part of Easter custom in many areas and often accompany other traditional Easter foods. Passover haminados are prepared with similar methods. Dark red eggs are a tradition in Greece and represent the blood of Christ shed on the cross. The practice dates to the early Christian church in Mesopotamia. In Greece, superstitions of the past included the custom of placing the first-dyed red egg at the home's iconostasis (place where icons are displayed) to ward off evil. The heads and backs of small lambs were also marked with the red dye to protect them. This page was last edited on 20 April 2019, at 06:46 (UTC).